I wrote about Giving Tuesday last week to prep you lovelies for today… the day… Thanksgiving has come and gone. You have survived Black Friday. You milked Cyber Monday for all that it is worth. Close out your holiday madness with Giving Tuesday. This is powerful stuff guys. 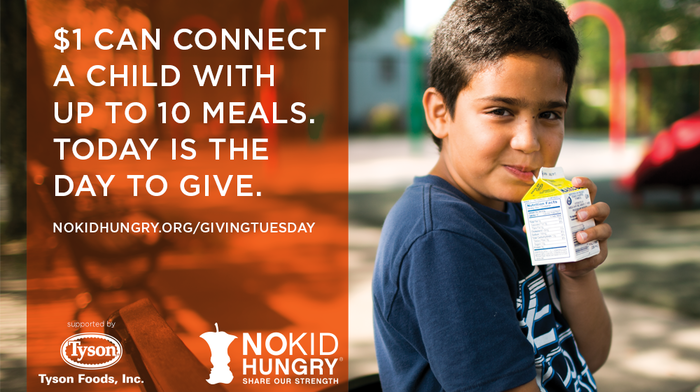 1 in 5 children in America go hungry every day. We are equipped to stop this, don’t tell me you aren’t. If you are online reading this post the least you can do is share it. If you have a dollar in your bank account you can pass it on and connect a child to TEN meals. The cool thing about today-Tyson Foods will match your donation up to 25k. Go there. Donate. Share it. Update a status or tweet for the givathon.